Official Language: Do you want to allow a certain company to operate table games and/or slot machines in York County, subject to state and local approval, with part of the profits going to the specific programs described in the initiative? A “Yes” Vote Means: Giving a specific developer a license to operate a casino in York County. Who Supports It: A coalition of 19 Maine small businesses, The Las Vegas developer who would own the casino license and casino investors. Who Opposes It: A Bad Deal for Maine PAC, Gov. LePage, BB Development LLC, DBA Oxford Casino-Hotel. Official Language: Do you want Maine to expand Medicaid to provide healthcare coverage for qualified adults under age 65 with incomes at or below 138% of the federal poverty level, which in 2017 means $16,643 for a single person and $22,412 for a family of two? A “Yes” Vote Means: Providing healthcare coverage to more than 70,000 Mainers by expanding Medicaid. A Yes vote on Question 2 will bring more than $500 million new dollars a year into the state and create an estimated 6,000 new jobs, while helping to ensure hospitals can continue to provide care in their communities. Thirty-one other states have expanded Medicaid under the Affordable Care Act, and expansion is supported by Democrats, Republicans and Independents. Who Supports It: Maine Small Business Coalition, Maine Hospital Association, Maine Medical Association, The American Nurses’Association – Maine, League of Women Voters, Planned Parenthood, Former Senator George Mitchell. Who Opposes It: Gov. LePage, Maine Heritage Policy Center, Christian Civic League. Official Language: Do you favor a $105,000,000 bond issue for construction, reconstruction and rehabilitation of highways and bridges and for facilities or equipment related to ports, harbors, marine transportation, freight and passenger railroads, aviation, transit and bicycle and pedestrian trails, to be used to match an estimated $137,000,000 in federal and other funds, and for the upgrade of municipal culverts at stream crossings? A “Yes” vote means: Approving a straightforward bond measure to support transportation projects across the state. Maine’s roads and bridges are in disrepair and investment has lagged in transportation infrastructure critical to moving people and goods. funds raised by these bonds are dedicated to xing our state’s transportation system. Who Supports It: Placed on the ballot by bipartisan vote of the Legislature and the Governor. Who Opposes It: No organized opposition. Official Language: Do you favor amending the Constitution of Maine to reduce volatility in state pension funding requirements caused by the financial markets by increasing the length of time over which experience losses are amortized from 10 years to 20 years, in line with pension industry standards? A “Yes” vote means: Stabilizing state finances and protecting Maine seniors. Question 4 is a simple, commonsense solution that will give the state’s retirement system more flexibility to meet its obligations to retirees in economic downturns, such as in 2008.
Who Supports It: Maine Public Employees Retirement System, Maine Center for Economic Policy, Maine Education Association, Maine State Employees Association. Placed on the ballot by bipartisan vote of the Legislature. Election Day is Tuesday, November 7th, 2017. Please remember to vote! 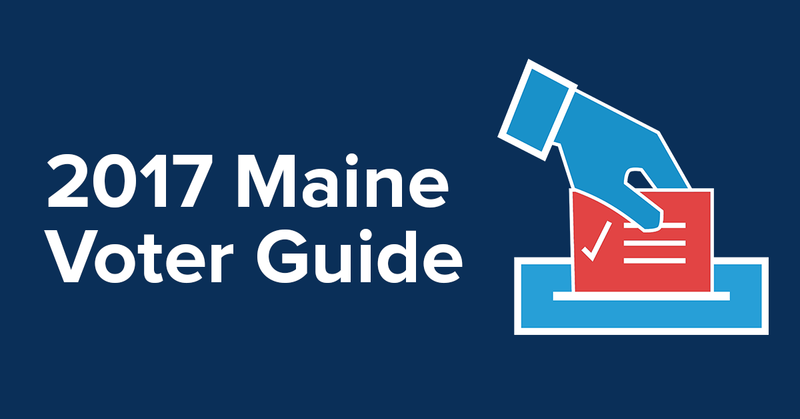 It’s never too late to register to vote in Maine. You can register to vote until, and including, Election Day. There is no cut-off date for registering to vote in person at your town office or city hall. On Election Day, you can register right at your polling place. © Copyright 2019 Website provided by Maine People’s Resource Center, who believe that a strong democracy depends on informed voters! 565 Congress Street, Suite 200; Portland, ME 04101 Questions can be directed to info@mprc.me.